Luxury is being redefined. In a world of constant disruption brought on by the advent of new technology, the original code of luxury has been overthrown by a new set of rules. For luxury consumers, value is no longer prominently found in the tangibles but rather in an elevated state of living brought on by the intangibles. And what this means for anyone trying to promote a luxury product or service is simple. 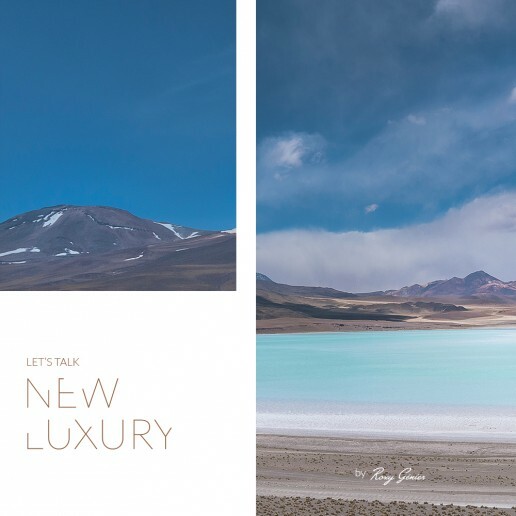 You must embrace the new values of luxury such as authenticity, transparency, sustainability, and connectivity to reach the heart and soul of your prospective clients. Based on the New Luxury Manifesto, Let’s Talk New Luxury is your guide to understand the changing definition of luxury where old rules and new rules are a constant duality, to speak the new lexicon of luxury values while staying true to its traditional foundations, and to be better prepared to service the luxury consumer of the future. Due to the nature of some of our content, you must be at the legal age of 18 years old to use this website. Roxy Genier (collectively, “Roxy Genier” or “the Service”) is owned and operated by Roxy Genier (collectively, “us”, “we” or “the Company”). A testimonial, signed by the authorized person acting on behalf of the owner of the copyright content, explaining why you claim that the use of the Content is not authorized; that the info in your testimonial is truthful; that you are the copyright owner or that you are authorized to proceed on the copyright owner’s behalf; and send declaration addressed to Roxy Genier by Roxy Genier at info at RoxyGenier dot com. Users access this website at his/her/its own risk and are solely responsible for any damage to their computer system or loss of data that results from the download of any material from Roxy Genier. You recognize and agree that Roxy Genier is provided on an “as is” and “as available” basis and that Roxy Genier and its suppliers hereby disclaim all warranties of any kind, express or implied, including, without limitation, the warranties of merchantability, fitness for a particular purpose and non-infringement. Under no circumstances will the Company be accountable for any loss or damage, including but not limited to any loss or damage to any User Content, damage for loss of profits or any other pecuniary loss or personal injury or death, resulting from anyone’s use of the Site or the Service, any User Content or Third Party Content posted on or through the Site or the Service or transmitted to Users, or any interactions between users of the Site, whether online or offline. You agree to indemnify and hold Roxy Genier and its employees and agents harmless from and against all liabilities, legal fees, damages, losses, costs and other expenses in relation to any claims or actions brought against Roxy Genier arising out of any breach by you of these Terms and Conditions or other liabilities arising out of your use of this Website. Despite anything to the contrary contained herein, Roxy Genier ’s total liability to you, for any causes whatsoever, and regardless of the form of the action, shall be limited to the amount of 400 $ (Canadian dollars) if fees have been paid for the Service. You acknowledge that if no fees have paid to Roxy Genier for the service, you shall be limited to injunctive relief only, unless otherwise permitted by law, and shall not be entitled to damages of any kind from the company, regardless of the cause of action. If you are not satisfied with the Service provided by the Website, your sole and exclusive solution is to discontinue using Roxy Genier. Some jurisdictions may not tolerate the exclusion of certain warranties or the limitation or exclusion of liability for incidental or consequential damages and such disclaimers or limitations may not apply to you. This Agreement shall be governed by and construed in accordance with the laws of Québec and the federal laws of Canada applicable therein. Use of this Site is unauthorized in any jurisdiction that does not give effect to all provisions of these Terms and Conditions, including, without limitation, this paragraph. If we decide to change Terms & Conditions, we will post those changes on this page, and/or update the Terms & Condition modification date below. Policy changes will apply only to information collected after the date of the change. These Terms & Conditions were last modified on October 11, 2018. If there are any questions regarding these Terms & Conditions, you may contact us at info at roxygenier dot com.